Anyway, it’s Handmade Monday and I’ve really been remiss (sick is more like it) but I’m back! 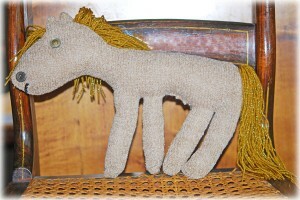 So, after you check out the little Sweater Pony, go on over to Handmade Monday and see what everyone else is doing. I know they are doing wonderful things! That is such a beautiful personal gift! I love it! He is lovely – such a gorgeous main and tail, great colour. A really nice gift. Hope you have a good week. Thank you, it’s getting better!